Students and teachers from the Kainai Board of Education on the Blood Reserve in southern Alberta collaborated in creating the Mokakioyis web site alongside Galileo teacher mentors. The students’ inquiry-based studies invited them to investigate how traditional relationships to and within our ecosystems inform current environmental and cultural practices. 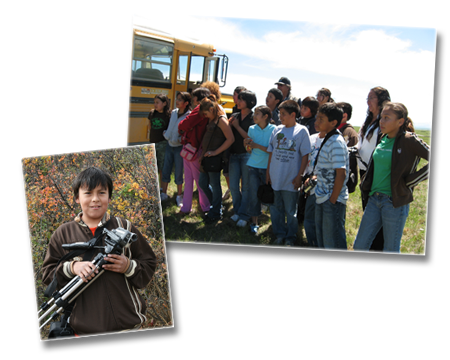 Students from Tatsikiisaapo'p Middle School and Kainai High School acted as interviewers, videographers, storytellers, musicians, biographers, artists, and photographers. You will see their work throughout this site. To facilitate ongoing learning and sharing, a community web space has been created to encourage students and teachers to share and post their ideas, photos, videos, and music, and to engage in dialogue with others about traditional and environmental knowledge in their communities. Content within this web space is accessible without a login. However, if anyone wishes to edit or upload additional content, they must first request a Ning account and receive approval from one of the participating teachers or Galileo.